The photo at left was taken from inside a Walmart store in Cincinnati, Ohio, confirming that Cardfight!! Vanguard has spread into the midwestern United States. Combined with the previous information established regarding where the game is being stocked, and recent sightings in Georgia, Vanguard's territory now encompasses at least six of the fifty states. As Ohio is the first confirmed location to not be a border state, this suggest that the game has a much larger presence than can be reasonably estimated from the current information. These packs are retailing for $3.98 apiece, a dollar more than most retailers would sell the cards for. However, as Walmart is not in the business of selling singles, they do not as some suppliers do, weigh their boxes beforehand in order to keep RRR and SP rarity cards out of their customers' hands and on the shelves. 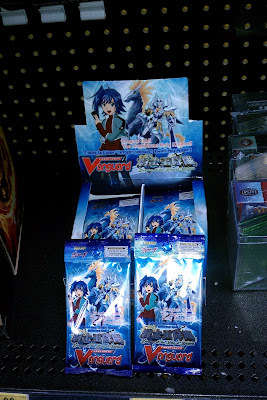 Furthermore, a source whom will remain anonymous to protect their privacy has recently confirmed that a Toys R Us in Cerritos, California was seen selling Cardfight!! Vanguard booster packs individually for $4.99. Neither of these stores have been confirmed as stocking the second booster set or trial decks.